Outdoor grill / prep station is perfect for entertaining. Where can I buy the lounge chair and ottoman? - Where can I find the lounge chair and ottoman? Where can I get the rocking chair in Arizona? Where did you get the stone veneer? Great pictures - love the flow of the home - do you have any pictures of the entire floorplan? What is the material and color of your decking? - What is the material you used for the decking? What kind of tree is that on the table? Also would love to know what type of tree that is on the table! What material did you use for the outdoor kitchen countertop? - Curious if whatever you chose has held up well to weather? Thank you. Exhaust Ventilation? - Did you design any exhaust ventilation in the ceiling for the grill? Wine fridge and fridge - May I know what brand that are? 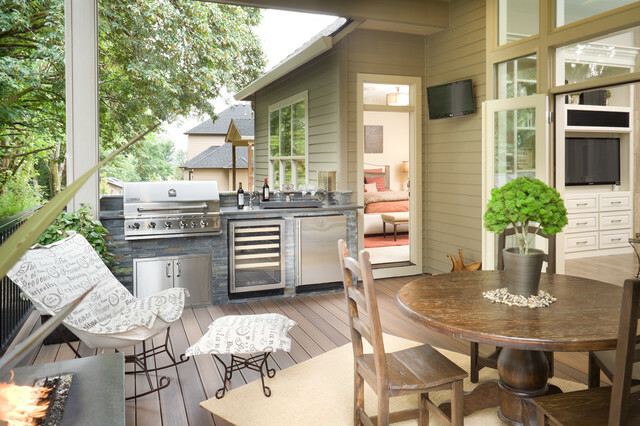 What is the length of the outdoor kitchen? - I am looking to install a smaller outdoor kitchen and this seems like a great length that includes all the amenities Im looking for. Thanks. What is the counter top material used for the kitchen? - I have the same stone veneer and I would like to get a neutral counter top like that. Can you provide me details on that? Thanks for your time. Stone veneer - What is the stone on the surround of the BBQ? Stone work - What brand/style stone is used on face of island? What was the distance between your patio pole and the house? - Trying to figure out how can i fit my grill maybe a sink and mini frig. Do you have an image of the whole structure? venting of grill - We are building a naw home and our back area is located like this one. How is this vented so all our smoke does not go into our neighbor's backyard and house? Floors - What are the floors? Outdoor cooking area - what are the dimensions for the outdoor cooking area. I am doing renovations and would like to build in something like that outside of the pantry, but I didn't know how much space would be needed and this perfectly fits what I would want. Do you a view of this that shows the overall structure? What paint color? - Paint of the house? Building our dream home: - Is this deck Trex? Where can I get the round pedestal table? Love it! thanks. Are the bottom doors flush with the bluestone? 6. Clean the grill before barbecue season ends. It's true, there is still some prime grilling weather ahead of us, but that barbecue probably got a lot of use this summer, and it's time for a little deep cleaning. We all know how to clean the top of the grate with a wire brush, but Lifehacker has a great video tutorial showing how to clean all the parts of a grill. 9. Consider a mini fridge. If you cook out a lot, it may be worth it to add a small fridge to your grill area. It's perfect for keeping meat at hand yet out of the sun — and for storing icy beverages for the chef. something like this on the shared wall ( south side) with maybe the wood look that you liked behind it?